The original US Web Development Contract has been edited by a solicitor in the UK to conform to English/UK law. Edit as needed to create your starting contract for your business. Each client may require modifications to the standard contract which you will need to deal with on a per-project basis. You may use the various contracts and agreements as starting points for use in other countries. You will need to have your own attorney review and edit the contracts for use in other countries and states where the standard pre-written versions will not be applicable. If you find an attorney who wants to redo everything from scratch their own way, consider getting a second opinion, unless you are in a country where US, English or Canadian law do not apply. Due to the differences between US and English/UK Law this version is much longer. For small projects see the Australian/UK short form. the days of handshakes are over, and you must protect yourself. I know this first hand for a fact. Sixteen (16) years in the business of dealing with legal matters tells me everyone doing any business should have this in their system just as they have spell check and a thesaurus." This Web Site Development Agreement (UK) is included in editable Word format that can be customized in Word or by using the included Wizard software. 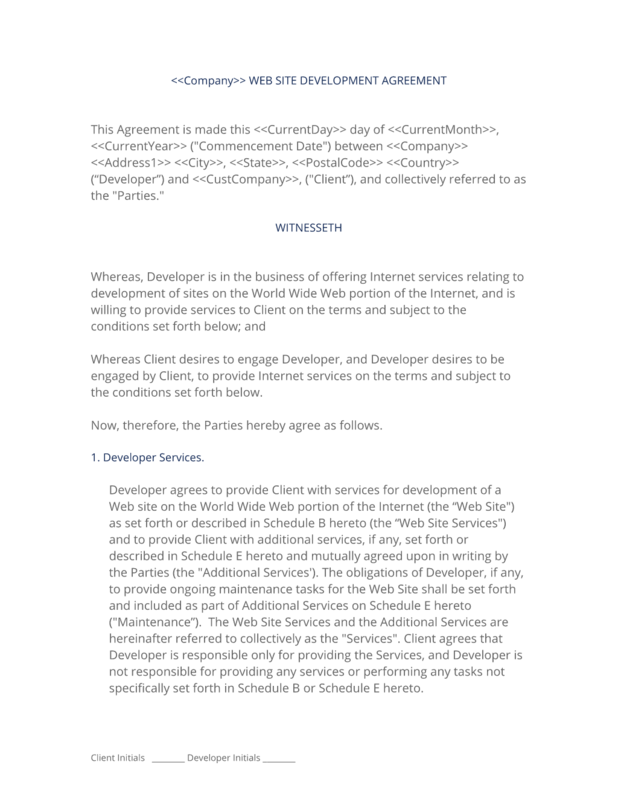 How do you write a Web Site Development Agreement (UK) document? This Agreement is made this Current Day day of Current Month, Current Year ("Commencement Date") between Company Name Address City, State, Postal Code Country ("Developer") and Company Name, ("Client"), and collectively referred to as the "Parties. Whereas, Developer is in the business of offering Internet services relating to development of sites on the World Wide Web portion of the Internet, and is willing to provide services to Client on the terms and subject to the conditions set forth below; and. Whereas Client desires to engage Developer, and Developer desires to be engaged by Client, to provide Internet services on the terms and subject to the conditions set forth below. Now, therefore, the Parties hereby agree as follows. Developer agrees to provide Client with services for development of a Web site on the World Wide Web portion of the Internet (the "Web Site") as set forth or described in Schedule B hereto (the "Web Site Services") and to provide Client with additional services, if any, set forth or described in Schedule E hereto and mutually agreed upon in writing by the Parties (the "Additional Services'). The obligations of Developer, if any, to provide ongoing maintenance tasks for the Web Site shall be set forth and included as part of Additional Services on Schedule E hereto ("Maintenance"). The Web Site Services and the Additional Services are hereinafter referred to collectively as the "Services". Client agrees that Developer is responsible only for providing the Services, and Developer is not responsible for providing any services or performing any tasks not specifically set forth in Schedule B or Schedule E hereto. Developer, in consultation with Client, shall prepare detailed written specifications for the Web Site (the "Specifications). The Specifications shall consist of, among other things, a design for the Web Site, a flow-chart of the pages for the Web Site, programming and interactive feature requirements, and the placement of any content or other materials which are to be incorporated into the Web Site. The Specifications shall be subject to any restrictions or limitations set forth in Schedule B or Schedule E.
The Specifications which have been mutually agreed upon by the Parties in writing shall be attached hereto as Schedule B and Schedule E. If the Parties are unable to agree in writing to mutually acceptable Specifications, after using good faith efforts, on or before days after the Commencement Date, either party may terminate this Agreement by providing written notice to the other party. Such termination shall not relieve Client from the obligation of paying Developer for all fees due and owing Developer as of the date of such termination. "Client Content" shall mean any materials provided by Client for incorporation in the Web Site, including, but not limited to, any images, photographs, illustrations, graphics, audio clips, video clips or text. Client shall deliver the Client Content to Developer in an electronic file format specified and accessible by Developer (e.g., txt, gif) or as otherwise specified in the Specifications. Any services required to convert or input Client Content not set forth in the Specifications shall be charged as Additional Services. Client shall promptly deliver all Client Content to Developer as required by Developer. Upon Specifications being mutually agreed, and upon Developer's receipt of the Client Content and any fees called for in Schedule A hereto, Developer shall commence tasks associated with the development of the initial version of the Web Site ("Initial Version") and notify the Client of the URL (Uniform Resource Locator) or other address of the Initial Version. Developer shall use combinations of technology as Developer, in consultation with the Client, deems appropriate to develop the Web Site. Client shall have Days days, or such time as otherwise agreed by the Parties in writing, from the date of a written notice of completion of the Initial Version from Developer to review and request in writing from Developer revisions to the Initial Version. Upon receipt of such requests, Developer shall use commercially reasonable efforts to implement such revision requests that are within the scope of, and consistent with, the Specifications. If Client wishes to implement any revisions to the Web Site that deviate in any material respect from the Specifications, Client shall submit to Developer a written change order containing (i) such revisions in detail and (ii) a request for a price quote for each change (collectively, the "Change Order). Developer shall promptly evaluate the Change Order and submit to Client for its written acceptance a proposal for undertaking the applicable tasks and a price quote reflecting all associated fees associated with Client's Change Order. Client shall have Days business days from receipt of such proposal to accept or reject Developer's proposal in writing. If Client accepts Developer's proposal to undertake the work necessitated by the Change Order, then the Change Order, as supplemented and/or modified by Developer's proposal, shall amend and become a part of the Specifications in Schedule B and Schedule E as appropriate and Schedule A hereto (Fee and Payment Schedule), and Developer shall proceed to implement such revisions in accordance with the Specifications and Schedule B and Schedule E as so modified. If (i) Client has not made any requests for revisions by the end of Days days from the date of written notice of completion of the Initial Version from Developer, or by such time as otherwise agreed by the Parties in writing, or (ii) upon completion of implementation of such requests which were mutually agreed upon by the Parties under the revised Specifications, the Web Site shall be deemed accepted by Client ("Acceptance"). Upon Acceptance of the Web Site and payment of all fees called for in Schedule A hereto, Developer shall transfer the Web Site to the computer system owned and operated by Client and/or its designated third party contractor, identified on Schedule B hereto, through which the Web Site may be accessed via the World Wide Web portion of the Internet (the "Host Server). Subsequent to the execution of this Agreement by the Parties, in the event Developer and Client agree that Developer is to perform additional tasks not in the original scope of Services hereunder, then the Parties shall execute a work order form (each an "Order Form) in the form attached hereto as Schedule F, upon which each such Schedule F shall be incorporated into and shall become a part of this Agreement and shall be subject to the terms and conditions hereof. As between Client and Developer, Client Content shall remain the sole and exclusive property of Client, including, without limitation, all copyrights, trademarks, patents, trade secrets, and any other proprietary rights. Nothing in this Agreement shall be construed to grant Developer any ownership right in, or license to, the Client Content, except as provided in Section 3.2 of this Agreement. Subject to Client's ownership interest in Client Content, all materials, including, but not limited, to any computer software (in object code and source code form), script, programming code, data, information or HTML script developed or provided by Developer or its suppliers under this Agreement (with the exception of original elements of audiovisual displays created hereunder specifically for Client, which shall be deemed to be part of Client Content), and any trade secrets, know-how, methodologies and processes related to Developer's products or services, shall remain the sole and exclusive property of Developer or its suppliers, including, without limitation, all copyrights, trademarks, patents, database rights, trade secrets, and any other proprietary rights inherent therein and appurtenant thereto (collectively "Developer Materials'). To the extent, if any, that ownership of the Developer Materials does not automatically vest in Developer by virtue of this Agreement or otherwise, Client hereby transfers and assigns to Developer all rights, title and interest which Client may have in and to the Developer Materials. Client acknowledges and agrees that Developer is in the business of designing and hosting Web sites, and that Developer shall have the right to provide to third parties services which are the same or similar to the Services, and to use or otherwise exploit any Developer Materials in providing such services. Each party agrees that during the course of this Agreement, information that is confidential or proprietary may be disclosed to the other party, including, but not limited to software, technical processes and formulas, source codes, product designs, sales, cost and other unpublished financial information, product and business plans, advertising revenues, usage rates, advertising relationships, projections, and marketing data ("Confidential Information"). Confidential Information shall not include information that the receiving party can demonstrate (a) is, as of the time of its disclosure, or thereafter becomes part of the public domain through a source other than the receiving party, (b) was known to the receiving party as of the time of its disclosure, (C) is independently developed by the receiving party, or (d) is subsequently learned from a third party not under a confidentiality obligation to the providing party. Except as provided for in this Agreement, each party shall not make any disclosure of the Confidential Information to anyone other than its employees who have a need to know in connection with this Agreement. Each party shall notify its employees of their confidentiality obligations with respect to the Confidential Information and shall require its employees to comply with these obligations. The confidentiality obligations of each party and its employees shall survive the expiration or termination of this Agreement. Unless otherwise agreed to in writing by the Parties, Developer shall have the right to place proprietary notices of Developer and its suppliers (including hypertext links related thereto) on the Developer Materials and on the Web Site, including developer attribution and hypertext links to Developers web sites, and to change or update such notices from time to time upon notice to Client. In no event may client remove or alter any Developer proprietary notice from the Developer Materials or the Web Site without Developers prior written consent. Client hereby grants to Developer a non-exclusive, worldwide, royalty-free license to edit, modify, adapt, translate, Schedule, publish, transmit, participate in the transfer of, reproduce, create derivative works from, distribute, perform, display, and otherwise use Client Content as necessary to render the Services to Client under this Agreement. Developer hereby grants to Client a limited, non-exclusive, non-transferable, royalty free license solely to make use of Developer Materials which are incorporated in the Web Site and which are required for the operation of the Web Site solely to operate the Web Site on the Host Server. Developer hereby reserves for itself all rights in and to the Developer Materials not expressly granted to Client in the immediately foregoing sentence. In no event shall Client use any trademarks or service marks of Developer without Developer's prior written consent. Unless otherwise agreed to in writing by Developer, the transfer or attempted transfer of the Web Site to any host server other than the Host Server shall automatically terminate the foregoing license. Client assumes sole responsibility for: (a) acquiring any authorization(s) necessary for hypertext links to third party Web sites; and (b) the accuracy of materials provided to Developer, including, without limitation, Client Content, descriptive claims, warranties, guarantees, nature of business, and address where business is conducted; and (c) ensuring that the Client Content does not infringe or violate any right of any third party, including without limitation, intellectual property rights and without violating any law. Client shall provide Client Content that does not contain any content or materials which are obscene, threatening, malicious, which infringe on or violate any applicable law or regulation or any proprietary, contract, moral, privacy or other third party right, or which otherwise expose Developer to civil or criminal liability. Any such materials provided by Client to Developer which do not satisfy the foregoing requirements in this Section 5.2 shall be deemed to be a material breach of this Agreement. In consideration for that portion of the Services to be rendered by Developer in connection with developing and finalizing the Specifications, Client shall pay to Developer, upon execution of this Agreement, the fees identified in Schedule A hereto under the heading "Specification Fees" (the "Specification Fees') unless otherwise agreed and set out in Schedule A. Upon Acceptance of the Specifications by Client, Developer and Client shall negotiate in good faith to agree on fees to be paid by Client for the balance of the Services. Such agreed-upon fees and associated payment schedules shall then be inserted on Schedule A hereto under the heading "Non-Specification Fees" (the "Non-Specification Fees'), and initialed and dated by authorized representatives of each of the Parties. Client shall pay the Non-Specification Fees in accordance with the applicable payment schedule set forth in Schedule A hereto, provided that Developer expressly reserves the right to change the rates charged hereunder for the Services during any Renewal Term. In the event Developer and Client are unable to agree on Non-Specification Fees following completion of the Specifications and after negotiating in good faith, either Party may terminate this Agreement upon days prior written notice to the other Party. To the extent that Developer is to provide Maintenance under Schedule E hereto, Client shall pay for all Maintenance-related tasks on a time and materials basis, as invoiced by Developer, unless otherwise expressly provided on Schedule A hereto. Client shall pay, or promptly reimburse Developer for, any out-of-pocket expenses, including, without limitation, travel and travel-related expenses, incurred by Developer in connection with the performance of the Services. Unless otherwise agreed by the Parties in writing on Schedule E hereto, Client shall pay to Developer all fees for Additional Services on a time and materials basis as invoiced by Developer. Client shall pay to Developer all fees not specifically itemised on Schedule A within 30 days of the date of the applicable Developer invoice. If Client fails to pay any fees within 7 days from the date due according to Schedule A, or within 30 days from the date of an invoice, where applicable, then (without prejudice to the Developer's other rights and remedies) the Developer reserves the right to charge interest on such sum on a day to day basis (as well after as before any judgment) from the date or last date for payment thereof to the date of actual payment (both dates inclusive) at the rate of 2% above the base rate of Royal Bank of Scotland plc (or such other London Clearing Bank as the Developer may nominate) from time to time in force compounded quarterly. Such interest shall be paid on demand by the Developer. In addition, failure of Client to fully pay any fees within 30 days after the applicable due date shall be deemed a material breach of this Agreement justifying suspension of the performance of the Services by Developer, and will be sufficient cause for immediate termination of this Agreement by Developer. The Developer may withdraw the Web Site from the World Wide Web (if hosted by or on behalf of the Developer) forthwith in this event. Any such suspension does not relieve Client from paying past-due fees plus interest. Client shall be liable for any costs associated with such fee recovery, including, but not limited to, legal costs, court costs, and collection agency fees. Client shall pay or reimburse Developer for all sales, use, transfer, privilege, excise, value added tax and all other taxes and all duties, whether international, national, state or local, however designated, which are levied or imposed by reason of the performance by Developer under this Agreement; excluding, however, income taxes on profits which may be levied against Developer. Developer represents and warrants that (a) Developer has the power and authority to enter into and perform its obligations under this Agreement, and (b) Developer's Services under this Agreement shall be performed with reasonable skill and care. Developer further warrants to Client that, to the best of Developer's knowledge, the Developer Materials do not and will not infringe, or be misappropriations of, the property rights of third parties, provided, however, that Developer shall not be deemed to have breached such warranty to the extent that Client or its agent(s) have modified the Web Site in any manner or if the Web Site incorporates unauthorized third-party materials, through framing or otherwise. If the Web Site does not conform to the Specifications, Developers shall be responsible to correct the Web Site without unreasonable delay, at Developers sole expense and without charge to Client, to bring the Web Site into conformance with the Specifications. Client waives any other warranty, express or implied. Client acknowledges that Developers do not warrant that the Web Site will work on all platforms. Client acknowledges that Developers are not responsible for the results obtained by the Client on the Web Site. Client represents and warrants that (a) Client has the power and authority to enter into and perform its obligations under this Agreement, (b) Client Content does not and shall not contain any content materials, advertising or services that are inaccurate or that infringe on or violate any applicable law, regulation or right of a third party, including, without limitation, export laws, or any proprietary, contract, moral, or privacy right or any other third party right, and that Client owns the Client Content or otherwise has the right to place the Client Content on the Web Site, and (c) Client has obtained any authorization(s) necessary for hypertext links from the Web Site to other third party Web sites. Except for the limited warranties set forth in Section 7.1, developer makes no warranties hereunder and developer expressly disclaims all other warranties, express or implied, including, without limitation, warranties of merchantability and fitness for a particular purpose. Client agrees to indemnify, defend, and hold harmless Developer, its directors, officers, employees and agents, and defend any action brought against same with respect to any claim, demand, cause of action, debt or liability, including reasonable legal fees, to the extent that such action is based upon a claim that: (i) if true, would constitute a breach of any of Client's representations, warranties, or agreements hereunder; (ii) arises out of the negligence or wilful misconduct of Client; or (iii) any of the Client Content to be provided by Client hereunder or other material on the Web Site infringes or violates any rights of third parties, including, without limitation, rights of publicity, rights of privacy, patents, copyrights, trademarks, database rights, trade secrets and/or licenses. This indemnity survives the termination or expiration of this agreement. In claiming any indemnification hereunder, the Developer shall promptly provide the Client with written notice of any claim which the Developer believes falls within the scope of the foregoing paragraph. Client may, at its own expense, assist in the defense if it so chooses, provided that the Developer shall control such defense and all negotiations relative to the settlement of any such claim and further provided that any settlement intended to bind the Developer shall not be final without the Developer's written consent, which shall not be unreasonably withheld. The Developer shall indemnify the Client and keep the Client fully and effectively indemnified on demand against any loss of or damage to any property or injury to or death of any person caused by any negligent act or omission or wilful misconduct of the Developer, its employees, agents or sub-contractors or by any defect in the design or workmanship or supply of the Web Site Services. The Client shall indemnify the Developer and keep the Developer fully and effectively indemnified on demand against any loss of or damage to any property or injury to or death of any person caused by any negligent act or omission or wilful misconduct of the Client, its employees, agents or sub-contractors. Except in respect of injury to or death of any person (for which no limit applies) the respective liability of the Developer and the Client under sub-clauses (1) and (2) in respect of each event or series of connected events shall not exceed the total value of fees payable pursuant to Schedule A for the services to be supplied if the contract was performed in full. Notwithstanding anything else contained in this Agreement the Developer shall not be liable to the Client for loss of profits or contracts or other indirect or consequential loss whether arising from negligence, breach of contract or howsoever. The Developer shall not be liable to the Client for any loss arising out of any failure by the Client to keep full and up-to-date security copies of the Web Site computer programs and data it uses in accordance with best computing practice. Neither will the Developer be liable for any delay in delivery of the Web Site to the Host Server howsoever such delay may be caused. The provisions of this clause 9 survive the termination or expiration of this agreement. This Agreement shall be commenced when signed by the Parties and thereafter shall remain in Effect until the Developer delivers to the Client an operational Web site in accordance with the Specifications in and milestones (if any) set out in Schedule B and Schedule E. Client acknowledges, however, that any delivery deadline, and the other payment milestones listed in Schedule B and Schedule E, are estimates, and are not required delivery dates. In relation to these dates time shall not be of the essence and the Client must make required payments as per Schedule A in any event. This Agreement may be terminated forthwith by either party on giving notice in writing to the other if the other party shall have a receiver, liquidator or administrator appointed or shall pass a resolution for winding-up (otherwise than for the purpose of a bona fide scheme of solvent amalgamation or reconstruction), or a court of competent jurisdiction shall make an order to that effect or if the other party shall become subject to an administration order or shall enter into any voluntary arrangement with its creditors or shall cease or threaten to cease to carry on business, or in the case of an individual shall be adjudicated bankrupt. Any termination under sub-clause (1) shall discharge the parties from any liability for further performance of this Agreement and in the case of a termination by the Developer shall entitle the Developer to enter any of the Client's premises and recover any equipment and materials the property of the Developer (and so that the Client hereby irrevocably licenses the Developer, its employees and agents to enter any such premises for that purpose) and also to be paid a reasonable sum for any work carried out by it prior to such termination and in the case of a termination by the Client shall entitle the Client to be repaid forthwith any sums previously paid under this Agreement (whether paid by way of a deposit or otherwise) and to recover from the Developer the amount of any direct loss or damage sustained or incurred by the Client as a consequence of such termination. Any termination of this Agreement (howsoever occasioned) shall not affect any accrued rights or liabilities of either party nor shall it affect the coming into force or the continuance in force of any provision hereof which is expressly or by implication intended to come into or continue in force on or after such termination. Each party shall designate one person who will act as the primary liaison for all communications regarding the Services to be rendered by Developer hereunder. No forbearance, delay or indulgence by either party in enforcing the provisions of this Agreement shall prejudice or restrict the rights of that party nor shall any waiver of its rights operate as a waiver of any subsequent breach and no right, power or remedy herein conferred upon or reserved for either party is exclusive of any other right, power or remedy available to that party and each such right, power or remedy shall be cumulative. This Agreement supersedes all prior agreements, arrangements and understandings between the parties and constitutes the entire agreement between the parties relating to the subject matter hereof. No addition to or modification of any provision of this Agreement shall be binding upon the parties unless made by a written instrument signed by a duly authorised representative of each of the parties. Save as expressly provided in this Agreement, neither party shall assign or otherwise transfer this Agreement or any of its rights and obligations hereunder whether in whole or in part without the prior written consent of the other. All notices which are required to be given hereunder shall be in writing and shall be sent to the address of the recipient set out in this Agreement or such other address in England as the recipient may designate by notice given in accordance with the provisions of this Clause. Any such notice may be delivered personally or by first class pre-paid letter or facsimile transmission and shall be deemed to have been served if by hand when delivered, if by first class post 48 hours after posting and if by facsimile transmission when despatched. Words importing the singular include the plural, words importing any gender include every gender and words importing persons include bodies corporate and unincorporate; and (in each case) vice versa;. Any reference to a party to this Agreement includes a reference to his successors in title and permitted assigns;. The headings to the Clauses are for ease of reference only and shall not affect the interpretation or construction of this Agreement. Any dispute which may arise between the parties concerning this Agreement shall be determined by the English Courts and the parties hereby submit to the exclusive jurisdiction of the English Courts for such purpose. Developer and its personnel, in performance of this Agreement, are acting as independent contractors and not employees or agents of Client. Developer may use the name of and identify Client as a Developer client, in advertising, publicity, or similar materials distributed or displayed to prospective clients. Except for the payment of fees by Client, if the performance of any part of this Agreement by either party is prevented, hindered, delayed or otherwise made impracticable by reason of any flood, dot, fire, judicial or governmental action, labour disputes, act of God or any other causes beyond the control of either party, that party shall be excused from such to the extent that it is prevented, hindered or delayed by such causes. IN WITNESS WHEREOF, the Parties have caused this Agreement to be executed by their duly authorized representatives on. The complete Web Site Development Agreement (UK) - with the actual formatting and layout - is available in this Contract Pack.